Fitting Kadee's to Bachman 158/159 sprinters. ii) at the height that Kadee recomend, and which they provide a gauge for. There is a problem with choice i) - Bachman have not fixed the height of the NEM pocket and the Kadee NEM couplers do not have height offsets to allow adjustment. The following describes the fitting of a standard 'draft dear box' and the choice of coupling to give a suitable height and reach for the Kadee height gauge and to avoid buffer locking or in the case of the 159 corridor locking. This photo shows the longest coupling shank (25/64") with a centre offset Kadee #26 coupling fitted to the Bachman sprinter. 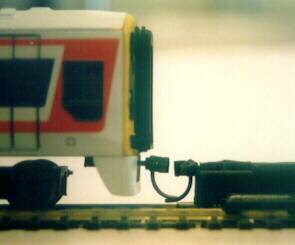 the Kadee standard height gauge can be seen next to it, the two heads do not ligh up, this is a recipe for unsheduled uncoupling. The first stage is to remove the Bachman body - remove the two philips head screws fore and aft and the body will part from the chassis, the plastic dummy coupling will then need to be removed, thuis was simply pulled out from its square hole in the chassis, I have then fitted the Kadee 'draft gear box' upside down (i.e. with the lid against the coach floor) so that the lip on the front of the box is just overlaping the end of the coach floor. 8ba brass screws were used to fasten the box to the floor. Using the Kadee draft gear box any almost any Kadee coupling can be fitted in seconds. If needed the height can be adjusted by using the shims available from Kadee, but the 159 does not nee them. 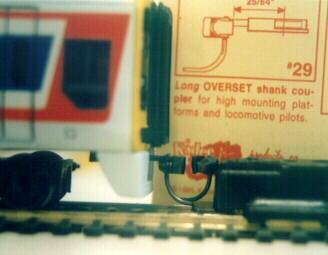 The overset shank couplers have a lower head, this allows the coupler head to line up perfectly with the Kadee gauge. Once the draft gear box has been fitted then a large variety of coupling options are available. 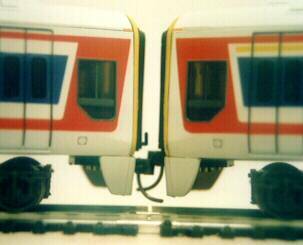 The choices are coupling head height, underset (high and may foul the coridor), centre set (still too high for the Kadee gauge it might be OK matching the NEM couplers but I have not tried this.) or overset (just right for the Kadee gauge).